Many of us sit long hours each day. The result is lower back pain, stiff necks and strained shoulders. The expression “sitting is the new smoking” speaks volumes to how much harm it does to our bodies. So, what can we do to counteract the effects of too much sitting? The obvious solution is to do the exact opposite… stand and move. I’ve created a “stand up” desk for myself which works great. While I’m on the computer I’m constantly shifting my feet and moving slightly. I also learned an exercise from my chiropractor that is both easy and simple. March on the spot for a minute every hour or so. Do this with knees lifted high and arms swinging enthusiastically. It may look silly but it works wonders! Source: Dr. Ryan Lees Blog | Simple but Effective. Small businesses and large corporations alike are being encouraged to help the environment and save energy. Whether you are an employee or a business owner, we can all make a difference with even small acts. Here are some ideas to help you along the way. Remember your 3 R’s. Recycle, Reduce and Re-use. Let clients know you are serious about being “green” by offering incentives. For example, for every purchase, you donate X amount to environmental causes. You gain clients and you also give back. Reuse your paper by printing on both sides or create note pads out of single side printed paper. Refuse flyers and un-solicited mail at your place of business. Instead of subscribing to magazine for your waiting area, consider other sources for these materials such as garage sales or sharing with another office nearby. Buy used office equipment, furniture and even computers. Sources such as Kijiji, eBay, craigslist and more have excellent quality if you snoop around. Recover or refurbish (or refinish) furniture if in need of a new look. Advertise and promote online (or in person) more and advertising in paper-related media less. When you tell your customers, you are “green” you are making a passionate statement. Scan or save documents and file electronically. Use monitors or projectors to share rather than printing. Insist on eco-friendly cleaning supplies for your business. Single use batteries for rechargeable batteries, etc. When we all do our small part, it makes a big difference while saving money in the long run. Each year there are millions of Christmas greeting cards sent. These cards use many tons of cardboard and paper and only some of them will be recycled. Let’s choose an alternative way to send out Christmas greetings. 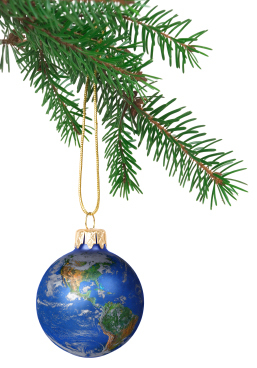 While the electronic Christmas card may not be as exciting as getting an envelope in the mail, it really is helping our planet. It has been our preferred choice and will be again this year. Small businesses and large corporations alike are all being encouraged to help the environment and save energy in any way possible. Whether you are an employee or a business owner, we can all make a difference with even small acts. Here are some common sense ideas to do your part. Set your computer to go to sleep automatically during breaks or meetings or if un-used for a set period of time. Turn OFF your computer a night. Turn off the lights if you will be away for 15 minutes or more. Leave your blinds open for natural light versus artificial light where applicable, especially in winter. On hot or warm days, leave the blinds closed as lights drain less energy that the average cooling system. Use a programmable thermostat and keep your heat set lower (wear layers). Every single degree saves 3% on energy use. Use compact florescent lights. A 25 watt compact florescent light bulb throws the same amount of light as a 100 Watt light bulb, but costs ¼ to run the lighting. Though the bulbs are pricier, many pay for themselves in savings in only one month. As the business world evolves and our client’s needs evolve, it’s important that our marketing strategies grow and change to meet those needs. Internet marketing, websites, blogs, social media and other ways of online promotion today have created a whole new business marketing world. More and more people are turning to the Internet to shop in the convenience of their own home or office, making comparison shopping very easy. This challenges the (older) corporate mindset to think outside the brochure and flyer door hanger box – but what they may not realize is that Internet and “paperless” marketing could help save our planet. Is paperless marketing “less” effective? Not in today’s day and age. So much printed materials provided in the mail or on door hangers are discarded (or hopefully recycled) the day of delivery – without a glance at the marketing material inside. Environmentally friendly consumers are starting to resent all the paper and refuse to do business with companies who use these old school methods of marketing. Alternatively, online marketing statistics show that viewers tend to stay on each website for at least one minute if the product or topic is of value to them. So, although the competition can be more challenging online, with the right tools in your box, you can come out on top. And if your business is marketing online, our planet thanks you too!